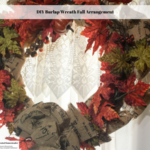 This DIY burlap wreath fall arrangement is perfect to hang on your door right through the Thanksgiving holiday. This fall arrangement is made with a French Themed Burlap that fits in perfectly with various French decor ideas, and when you add in the colorful leaves, pumpkins, and acorns you end up with a very colorful fall wreath. 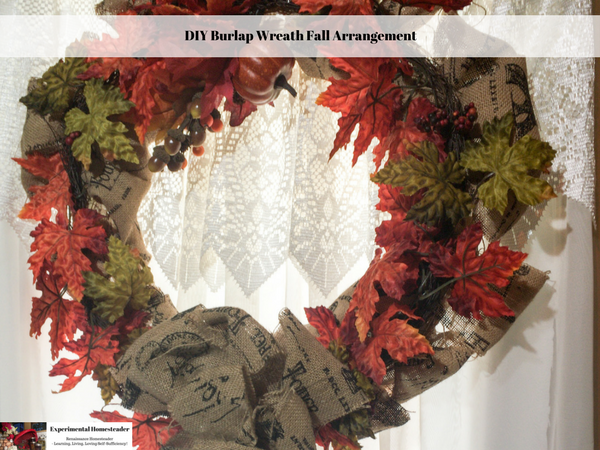 Here is how to make your own DIY burlap wreath fall arrangement to hang on your front door. 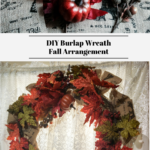 This project is really easy and you can always change the leaves and other decorations out to update the burlap wreath for the different seasons if you choose to. Cut the burlap into long strips that are 4 inches wide. You need three strips that are 36″ long for a small wreath. Larger wreaths will need more strips to completely cover them. Take two of the burlap strips and cut them in half, then set them aside. 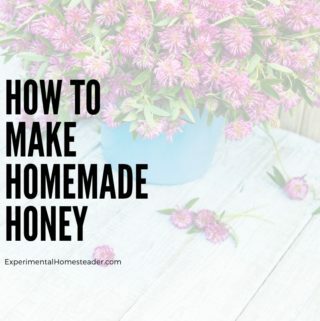 Start with the 36″ long piece of burlap and use a floral pin to attach it to the straw base wreath. Begin wrapping the burlap around the wreath base leaving 4 to 6 inches of burlap looped at the top along the outside of the wreath. Secure the burlap on the back of the wreath with more floral pins. 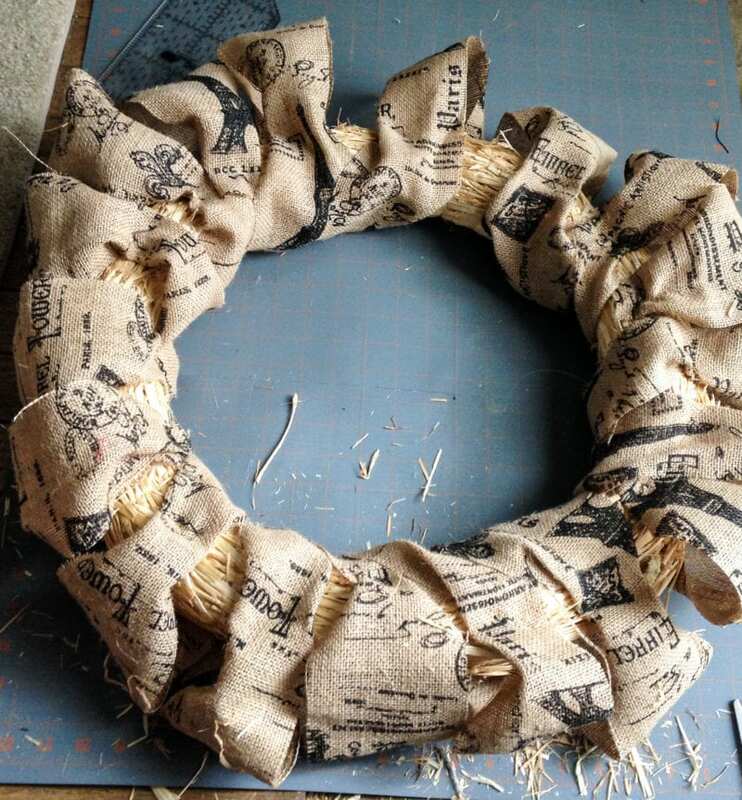 Repeat steps 4 and 5 until the entire wreath is wrapped in burlap. 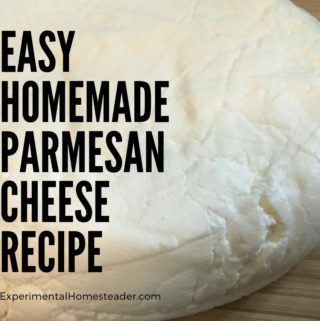 Cut additional burlap strips as necessary. Use the cotton cord to tie the burlap loops close to the top of the straw wreath. Wrap the silk leaf garland around the front of the straw wreath securing it with floral pins. Add the bunch of plastic pumpkins and acorns to the top of the wreath. Add a matching bow to the bottom of the wreath. Tie a piece of cotton cord to the top of the wreath to make it easy to hang. Hang up your burlap wreath up and enjoy it! Tip: Use a wreath storage container to store your wreath from year to year so it does not accidentally get damaged.